As the craft brewery market has boomed, the star of Oowee Products has risen. The small company is headquartered in Asheville, the mountain town that won the moniker “Beer City USA” back in 2009—the same year that Oowee incorporated. 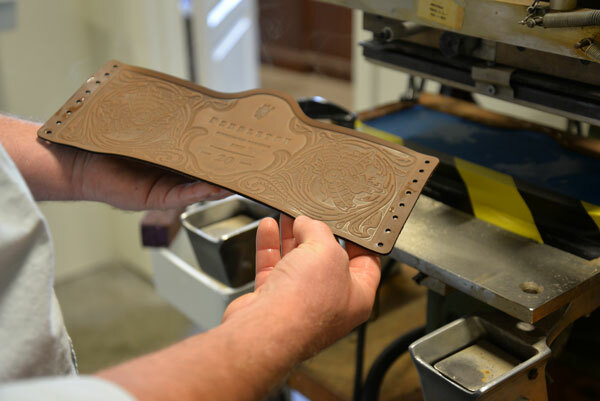 Oowee began making small batches of premium leather beverage accessories, like hand-stitched sleeves and hand-riveted coasters, to serve those local craft breweries and their customers. Now, the company also manufactures large runs of branded beverage accessories for breweries and distillers across the US, and uses Lean tools to reduce waste and streamline operations. Benefiting from waste reduction is typical after applying Lean, but Oowee has seen more unorthodox outcomes, too. In 2011, Oowee partnered with the Autism Society of America, employing adults on the autism spectrum to produce its intricately stitched beverage sleeves. Lean’s emphasis on work standardization and visual controls—including diagramming, color coding, and materials organization—have been invaluable as reference materials for the six autistic adults working in Oowee’s sewing room. Hargett reviews a particularly tricky lacing pattern with one worker, pointing to each step of the instructional diagram at the man’s station; the worker quickly gets the hang of it, and successfully recreates the pattern on the leather sleeve that he’s assembling. He and Hargett high five, smiling. As Oowee’s staff effortlessly turns out piece after piece of beautiful branded leather for a 14,000-piece order, it’s clear that they’ve turned the corner.